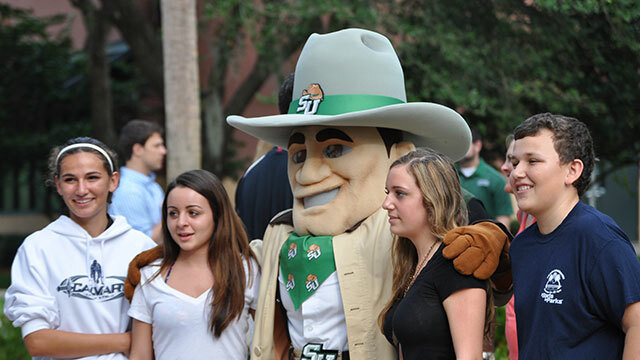 Hatter Saturday is the event for accepted students and is the beginning of your journey as a student at Stetson University. It's a day of fun and learning for both parents and students and the perfect opportunity for you to connect to your future home. Join us on Saturday, April 13, 2019! Get to know the academic community by attending our Academic Showcase! Each department and academic area of study will be represented by faculty or students to help enhance your knowledge in your intended major or degree. Success as a Hatter transcends the classroom experience. Learning and leading in our community helps our students be significant in the classroom and in life. Check out your perspective living and learning environment! All first-year residence halls will be featured on our campus tours to give you a glimpse of what your future home could look like. Lunch will be provided for you and your family on our Stetson Green! Enjoy lunch alongside fellow future hatters where a local artist will be performing for all of our guests. If you have questions, please contact the Office of Admission at 800-688-0101 or admissions@stetson.edu. Questions? Ask StetsonAdmission on Facebook or @StetsonAdmit or tag #NewHatter on Twitter. Use the #NewHatter hashtag while taking pictures throughout Hatter Saturday to enter Stetson's "New Hatter Pic of the Day" contest and other fun activities on social media!